Yahoo mail UK is the country-specific service provided by Yahoo which includes latest technology updates, weather forecast, news and other things associated with the United Kingdom. You can use the standard @yahoo.com or any other email addresses like @ymail.com or @rocketmail.com to login to Yahoo mail UK. Here in this page, we will guide you through the procedure of both Yahoo mail UK Sign up and Sign in step-by-step. Step 1: Open any web browser you prefer and type in any of these domains in the address bar of the browser. Either of these URLs will take you to the Yahoo mail UK homepage. Step 2: Click on the “Sign in” link at the top right of the page. 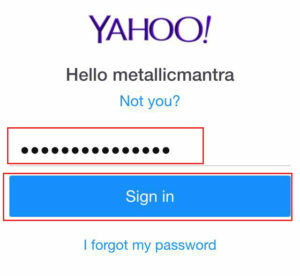 Step 3: Then, as the Yahoo mail Sign in page loads, click on the “Don’t have an account? 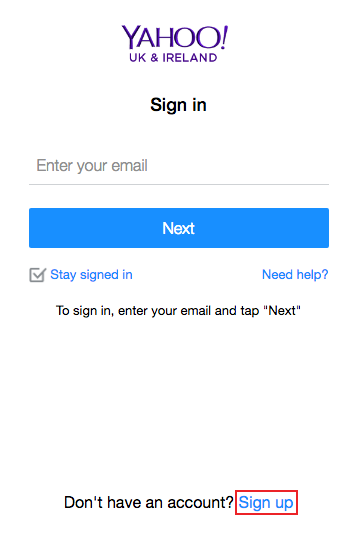 Sign up” link at the bottom of the Yahoo mail login box. 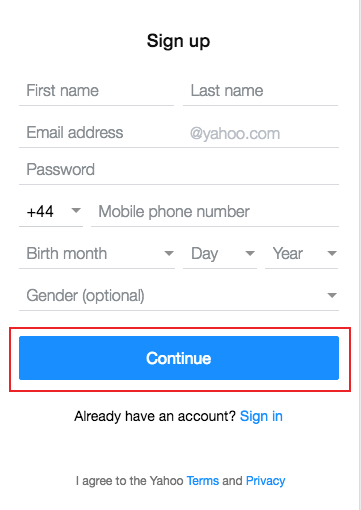 Step 4: You will be now directed to the Yahoo mail UK Sign up page. Start filling up the form to begin with the procedure. Type in your First and Last Name. Step 5: Enter your Yahoo email address in the second field. Currently, only the standard @yahoo.com extension is available. You can no longer sign up for the country-specific extension @yahoo.co.uk. 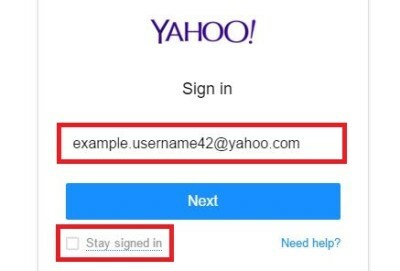 Choose a unique Yahoo Mail ID. Moreover, you can improvise your chosen username by adding letters, numbers and symbols to it if it’s already taken. Step 6: Chose your country code (+44 for UK) and enter you mobile phone number in the provided field. 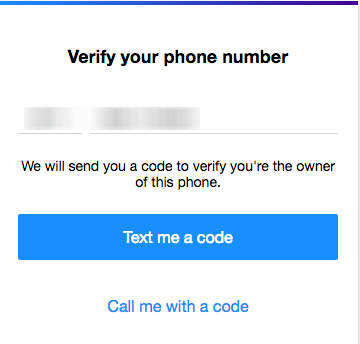 Your mobile phone number is required to verify your account and to recover your account credentials in case you lose your Yahoo mail username or password. Step 7: Chose your Birthday and Gender. Step 8: Click on the “Continue” button at the bottom. 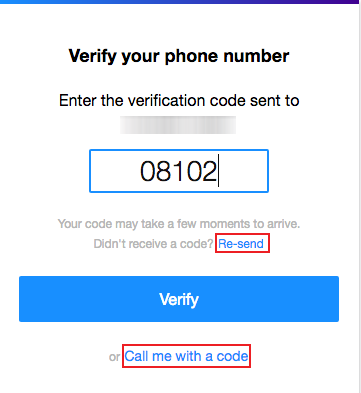 Step 9: You might be required to “Verify your phone number”. If prompted, you can either click “Text me a code” or “Call your mobile” whichever you prefer. Step 10: Enter the verification code you’ve received, in the next page that loads in the provided field. If you haven’t received the code, you can click on the “Re-send” link or “Call me with a code” as shown in the image below. Step 11: Finally, click on the “Verify” button and you’re done with Yahoo mail UK Sign Up. Now you’ll be taken to your Yahoo mailbox. Step 1: Go to yahoo.co.uk and click on the “Sign in” link. 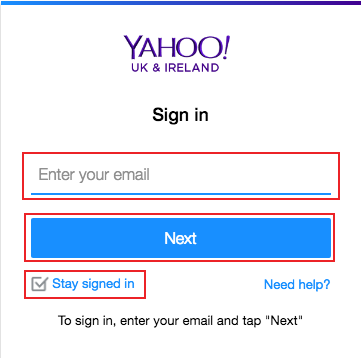 Step 2: In the Yahoo mail UK Sign in page that loads now, simply enter your Yahoo email address. Make sure you enter your full email address in the empty field. Step 3: Click on “Next”. You can select or deselect the “Stay signed in” box depending on whether you are using a personal or shared device. 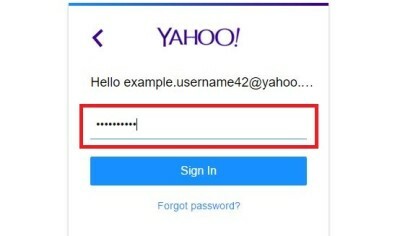 Step 4: Type in your Yahoo mail password. Step 5: Click on the “Sign in” button and Congratulations, you’ve completed Yahoo mail UK login. How to do Yahoo Mail USA? How to do Gmail Sign In? How to create Apple ID?